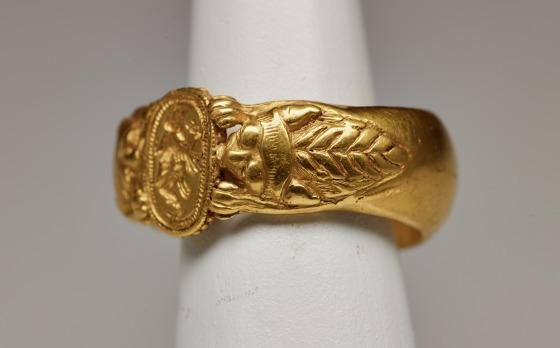 In addition their ornamental quality, most rings in antiquity were used for the practical purpose of making impressions upon yielding material. 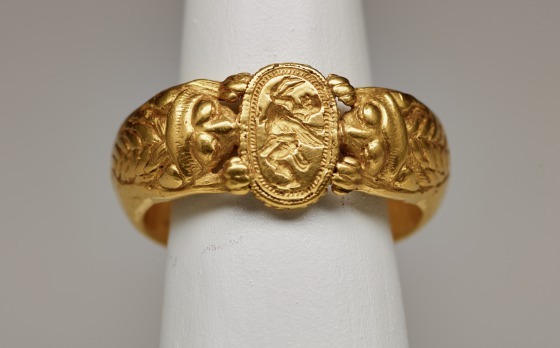 The Etruscan rings in the Dallas Museum of Art's collection illustrate how these two uses coincided; they are signet rings as well as decorative ornaments. 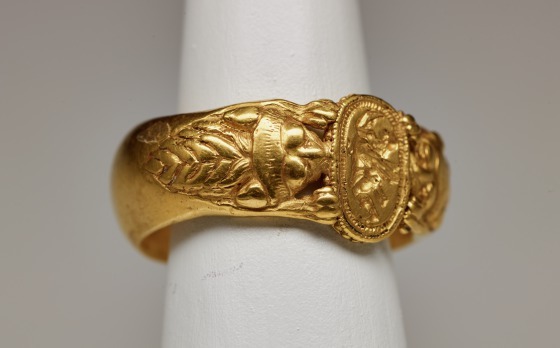 The exquisite gold rings of the collection have been considered purely Greek because rings of this type are frequently inlaid with engraved gemstones of Greek iconography and workmanship. 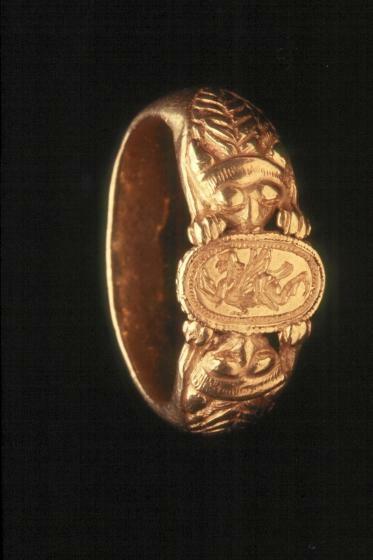 However, the typological and stylistic similarities of the lions' manes to those on earrings that are clearly Etruscan (1991.75.27.a-b, 1991.75.28.a-b), leave no doubt about the Etruscan origin of the rings. 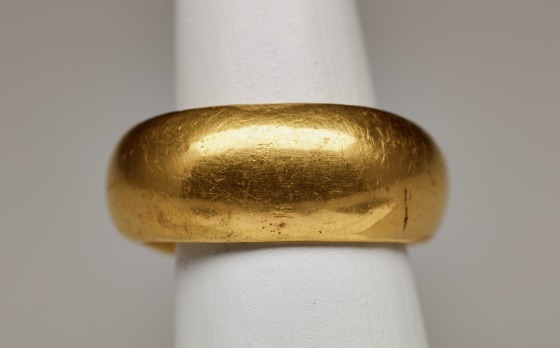 The bezel of this ring was inlaid with either an engraved gemstone or an engraved gold device. The hollow hoop of the ring was probably cast. An oval box setting is suspended in front of the hoop from the heads and forepaws of an elaborate double-lion protome. The lions' manes, heads, and legs are delicately modeled, and engraved details are added. The edges of the flat oval bezel are decorated with beading. Engraved in the gold field within a hatched border is a depiction of Hyacinthus riding Apollo's swan. According to Greek mythological tradition, Hyacinthus was a beautiful boy whom Apollo loved and killed accidentally with a discus. A flower of the same name sprang from the boy's blood. Barbara Deppert-Lippitz, Ancient Gold Jewelry at the Dallas Museum of Art (Dallas: Dallas Museum of Art in association with the University of Washington Press, 1996), 38; 129.